In 1947, the United Nations General Assembly presented Resolution 181, a partition plan on the basis of which the mandate territory of Palestine would be divided into a Jewish and an Arab state. The number of Jewish settlers had increased greatly in the previous years (up to 650,000) – afterwards augmented by homeless survivors of the Holocaust who were directed towards Palestine partly because Western states closed their borders to them. Despite this, they still did not make up more than a third of the inhabitants. 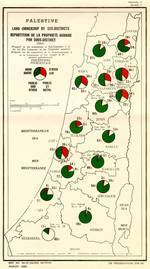 Nevertheless, within the framework of the Partition Plan, they were assigned 54 percent of the territory (of which they had managed to purchase only 7 percent in the previous seventy years). 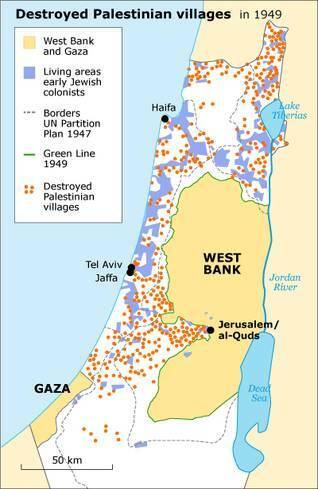 The Palestinians refused to agree to the partition in advance. However, the majority of Zionist Jews did support the partition, as it represented at least a partial realization of their agenda. General Assembly of the United Nations by a majority vote. The declaration of the State of Israel on 15 May 1948 meant disaster for the Palestinians. In the previous months, a detailed campaign of ethnic cleansing had already been set into motion – Plan Dalet – which was meant to drastically modify in advance the demographic relations in the newly established Jewish state (see for references to Ilan Pappé and other historians al-Nakba under Israel). Otherwise, just over half of the inhabitants of the State of Israel would be ‘non-Jewish’. This has been demonstrated by Israeli-Palestinian and Jewish Israeli historians on the basis of documents released from the Israeli state archives at the beginning of the 1990s. A stream of refugees resulted from a bloodbath that took place in the Palestinian village of Deir Yassin (Dayr Yasin) on 9 April 1948 – more than a month before the end of the British Mandate for Palestine. About 300,000 Palestinians had already taken flight before the declaration of the State of Israel on 15 May 1948. 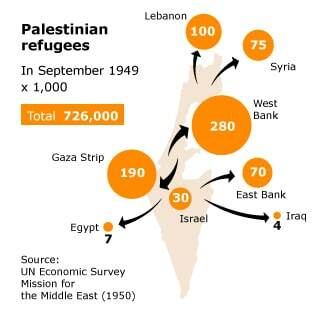 The result was a huge exodus of Palestinian refugees. Arab states which had declared war on Israel on 15 May and which had hastily sent limited numbers of soldiers in the direction of Palestine, could accomplish little in the face of the Israeli military strength. Eventually, about 725,000 Palestinians (83 percent of the Palestinian population) were displaced as refugees in Palestine or in other neighbouring Arab countries. Those who did not flee now formed a minority in a state which was established for Jewish citizens. In order to thwart, or even render impossible, the return of the refugees, more than five hundred depopulated villages were razed to the ground. Palestinians call these events in 1948 the Nakba (the Catastrophe). After the war, the former mandate territory of Palestine was divided into the State of Israel (which, after conquests, eventually spanned not 54 but 78 percent of the territory), the West Bank and the Gaza Strip (together, the remaining 22 percent). The borders between the two parts were random since they were drawn along the armistice lines between the various military forces.